Brief video introduction [created with Camtasia 2] explaining a student-produced Digital Humanities project investigating Madrid’s Gran Vía [created with Omeka / Neatline]. Explore the map-interface of the actual DH project here. My new book Antonio López García’s Everyday Urban Worlds: A Philosophy of Painting is entering production with Bucknell University Press – it should be available in August 2014 (appearing on amazon at present for pre-order). It represents rather a new form of writing for me – inspired by the meandering and philosophical style of Spanish author / civil engineer Juan Benet’s El ángel del señor abandona a Tobías (1976) where he mixes a range of disciplinary questions together, using the famed painting of the same name by Rembrandt as a point of departure. Here I’ve devoted a chapter each to specific paintings (Gran Vía, Madrid desde Torres Blancas, and Madrid desde la torre de bomberos de Vallecas…), which I use as points of departure to fold Spanish literature, film and urban planning together with larger interdisciplinary and philosophical, geographical questions. If you CLICK HERE you can see a ‘prezi’ that I’ve used with a lecture focusing on an excerpt of the second chapter’s Madrid desde Torres Blancas (visuals only). UCS 003 Fraser on Antonio López García’s Everyday Urban Worlds: A Philosophy of Painting https://urbanculturalstudies.files.wordpress.com/2013/08/003-alg_intro.m4a (6 August 2013) [BOOK TEASER] The author reads a concise draft introduction for a book in progress on the famed Spanish painter. Topics include art history, other Spanish painters (from Velázquez to Goya to Picasso, Dalí, Gris and M iró), Madrid’s urban space, temporality, and the book’s structure and interdisciplinary method (incorporating urban studies, geography, architecture, literature, cinema and more…). 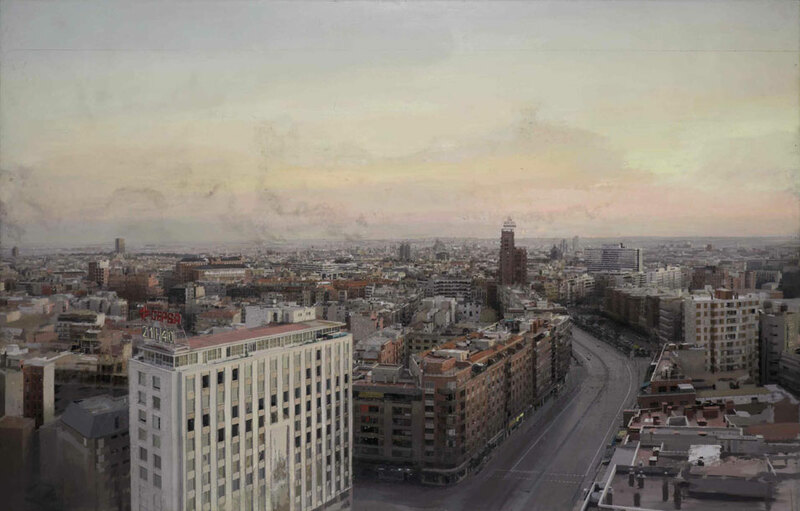 Born in Tomelloso in 1936, López García is an internationally recognized ‘hyperrealist’ painter, and in recent years his work Madrid desde Torres Blancas set an auction record at Christie’s for the sale of a work by a living Spanish artist. Antonio Lopez (b. 1936), Madrid desde Torres Blancas; signed and dated `A. Lopez Garcia, 1976-82′ (lower left), oil on board, 57.1/8 x 96.1/8in. (145 x 244cm.) Painted in 1976-82. Sold: $2,760,803. © Christie’s Images Limited. Beneath the pavement, the (Fascist) beach.